The ISS serves as a research laboratory that has a microgravity environment in which crews conduct experiments in many fields including biology, human biology, physics, astronomy and meteorology. The station has a unique environment for the testing of the spacecraft systems that will be required for missions to the Moon and Mars. The station is expected to remain in operation until at least 2020, and potentially to 2028. 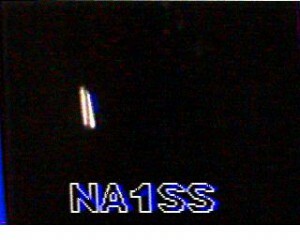 See the ISS Fanclub website. The Space Shuttle Amateur Radio Experiment, or SAREX, provided students with the unique opportunity to talk by radio with astronauts in the shuttle orbiting the Earth traveling about 27,360 kilometers (17,000 miles) per hour. With the help of amateur radio operators on the ground, students attempted to contact the astronauts by voice, packet (computer) radio, or television depending on the equipment the shuttle took into space. When students used the radio contact with the astronauts to ask questions about the experiments being conducted on the mission and what it is like living in space. Classes tracked the shuttle’s orbit using computer software, and “eavesdropped” on shuttle communications. When the astronauts were asleep, a robot computer amateur radio station aboard the shuttle was programmed to make contact with hams around the world automatically. Astronauts who are licensed ham radio operators participated in SAREX during their free time on missions. They made ham radio contacts with students around the world, exciting them about space, science and technology. The astronauts also contacted their families and friends, and individual ham radio operators. When students used the radio contact with the astronauts to ask questions about the experiments being conducted on the mission and what it is like living in space. Classes tracked the shuttle’s orbit using computer software, and “eavesdropped” on shuttle communications. When the astronauts were asleep, a robot computer amateur radio station aboard the shuttle was programmed to make contact with hams around the world automatically. When astronauts, cosmonauts and mission specialists from many nations fly on the international space station, they will have amateur, or ham, radio as a constant companion. Since its first flight in 1983, ham radio has flown on more than two-dozen space shuttle missions. Dozens of astronauts have used the Space Shuttle Amateur Radio Experiment, or SAREX, to talk to thousands of kids in school and to their families on Earth while they were in orbit. They have pioneered space radio experimentation, including television and text messaging as well as voice communication. The Russians have had a similar program for the cosmonauts aboard the Russian Space Station Mir. When U.S. astronauts were aboard Mir in preparation for the long duration missions of the international space station, they used amateur radio for communication, including emergency messaging while Mir was in distress. As human space flight moves into a new uncharted era, an organization called ARISS, which stands for Amateur Radio on international space station, has been formed to design, build and operate equipment. In 1996, delegates from major national radio organizations and from AMSAT, which stands for the Radio Amateur Satellite Corporation, in eight nations involved with the international space station signed a Memorandum of Understanding to form ARISS. 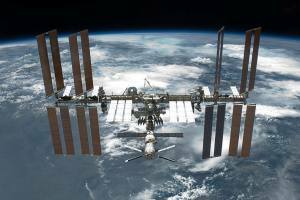 NASA and the Russian space organization Energia have signed agreements that spell out the place of amateur radio on the station. A technical team, called ISS Ham, has been officially established to serve as the interface to support hardware development, crew training and on-orbit operations. 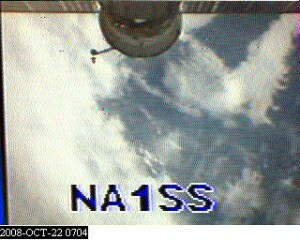 Thanks to the amsat mailing list, I heard that SSTV was enable on todays passes. 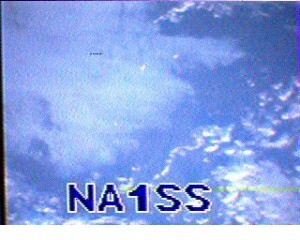 I received the following image from NA1SS during the pass of 01-26-2009 18:49 CEST in JO21ho. 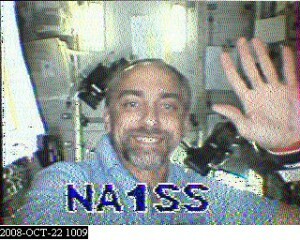 The mission that started October 15, 2008 with on board ham radio amateur, Richard Garriott (W5KWQ). During this mission the following modes are available, SSTV uplink/downlink: Richard is really not supporting SSTV uplinks during his short duration mission. The downlink is on the normal ARISS VHF downlink, 145.80. General Voice Contacts: Use the regular general voice frequencies. 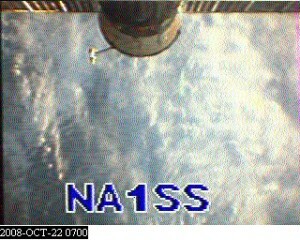 145.80 downlink. Uplinks are 144.49 in Region 2 (Americas) and 145.20 for Region 1 (Europe, Africa, Middle East) and Region 3 (Australia, Asia). Richard and Mike Fincke, KE5AIT, have been on the air on voice since shortly after docking yesterday. 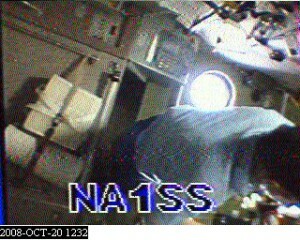 I recieved some SSTV pictures from the spacestation. I used MMSSTV version 1.11G made by JE3HHT to decode the following pictures.